The sky was blue, the grass was green, and the bicycles were fixed. Traverse City, Michigan, a small resort town on Lake Michigan, welcomed 90 or so committed fixed-gear aficionados to town August 12-14, for the 1st International Fixed Gear Symposium, hosted by Dennis Bean-Larson, facilitator of fixedgeargallery.com, and his lovely wife Katy. 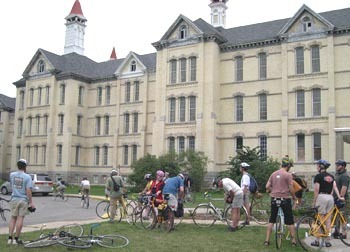 They chose the grounds of The Village at Grand Traverse Commons, known locally as "the Commons," site of a former state mental hospital. Folks were rolling in from all over the U.S. by Friday afternoon. 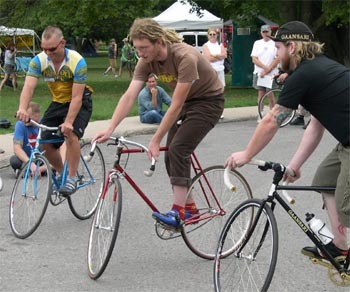 The exciting aspect of the event was the instant comaraderie as people unpacked their bikes. It's fun to see our postings on Dennis's site, but it's especially neat to see the bike in person, as well as the person! Tracy from Denver was the first to greet our merry band of Gaansari helpers. She cruised by on her Boston Baked Bean Steamroller, exclaiming "The Scorchers have arrived!" Pro guitarist and kinda newby fixie freak Eric Ambel rode by. He was excited to meet some folks and turn the pedals. He was also in town to play an acoustic set Saturday night during the banquet. We registered for the weekend's events, grabbed our spokecards, and set up shop. We also had the privilege of meeting and getting to know Sean and Brian, two deaf fixed-geared dudes from Minnesota and Washington, D.C. Their enthusiasm was contagious, as we communicated back and forth with quick notes in Sean's stenopad. It's amazing how we literally spoke the same language because of our passion for bicycles. In a few hours, Dennis unveiled his new Matt Chester titanium fixie, resplendent in its simplicity (and expertly assembled that very afternoon). We rolled out in waves of 15 or so for an evening ride through town. 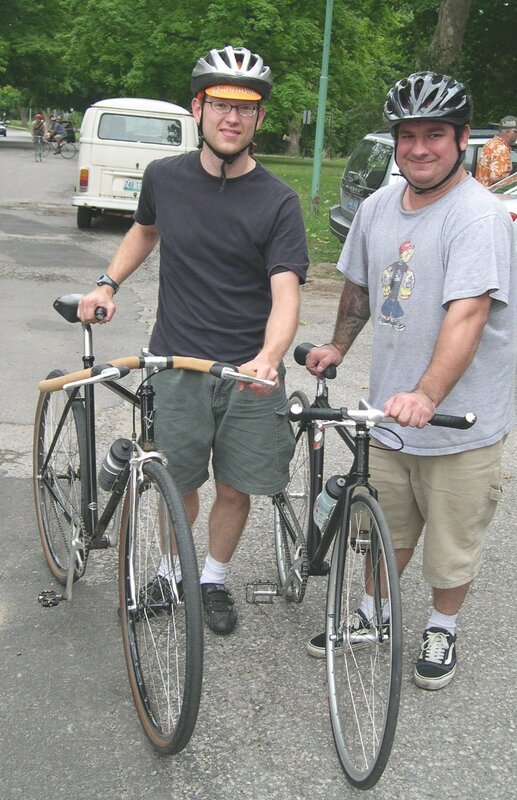 Friendships were made, stories told, and the two-wheeled fellowship was beginning. Dinner was scrumptious, the air was crisp, and we all called it a night. Saturday morning begain with a glorious sunrise, as participants made their way back to The Commons for the morning ride schedule. Ace wheelbuilder and Gaansari tech extraordinaire Justin was having a little trouble keeping his bottom bracket tight, so we took a pass on the group ride. As Justin dialed in his new Scorcher, I rode with Jon, Jason and Lesley from Jonny Cycles, a new brand of exquisitely simple and clean bikes. We ate breakfast in town, got to know each other better, then made our way back to the Commons to set up our booths for the event. Jon and Jason are amazing skidders (Jon's second skid was an impressive 585 footer) and fine track standers as well. The tricky part of the skidding contest was: generating enough speed around the circular drive before laying the skid, in between several deep potholes and uneven patches of asphalt. Our Man Justin took the track standing competition, outlasting all comers with 6 minutes, 14 seconds. Justin also won the bike building contest with a time of 5 minutes, 25 seconds. Nearly everyone attended my presentation, "Wilbur and Orville Wright: The Original Scorchers - How the Wrights Inpsired Cycles Gaansari." I tried to pass on my accumulated knowledge of the Wright Brothers as bicyclists, bike builders, and humble aviation heroes. I hope someone gained some insight. The fun continued throughout the day, and culminated with a festive banquet, replete with a raffle drawing for goodies from exhibitors and well-wishers. Some lucky folks (yours truly) went away with one of Dennis's Cog Mugs, thrown pottery from the man himself. 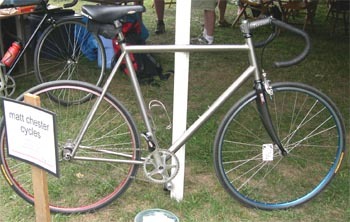 Gary Boulanger ran the excellent Cycles Gaansari in Dayton, Ohio, and is now involved in a novel aid project in Rwanda. Exhibitors and sponsors included: Peace Coffee; Cycles Gaansari; NYC Bikes; Brickwheels; Town & Country Real Estate; McLain Cycle; Velocity USA; Jonny Cycles and Garfield Auto Service Center, Traverse City, MI, all of whom were included on the really boss event T-shirt. For those of you who may have missed it at the Symposium or weren't there, here is James Bernard Lee's ground breaking paper on the benefits of fixed gear. Dennis Bean Larson, organiser of the Symposium, runs the amazing Fixed Gear Gallery.